Whatever the future holds for the university, we are not going to master it unless we understand its past. In particular, calls to split research and teaching, and to replace the traditional professor with MOOCs (Massively Open Online Courses) and other forms of pre-packaged content delivery presuppose that the university has been primarily a content-delivery service, which might then be superseded by more efficient information-delivery technologies. 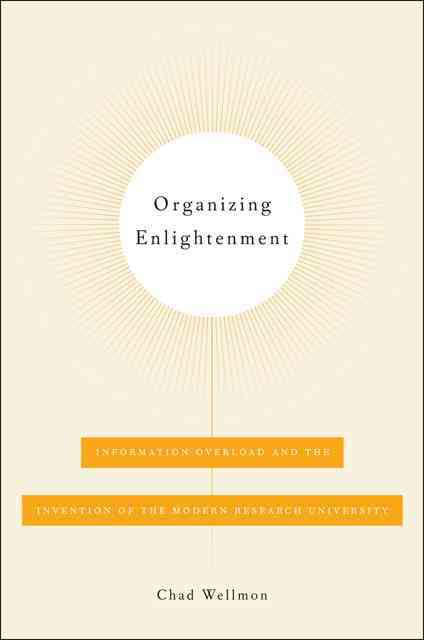 In this important, illuminating and well-written book, Chad Wellmon argues that the research university evolved primarily to fulfil the function of information control rather than delivery. During the last third of the eighteenth century, the ever-increasing growth of the modern print industry created problems of information overload for an intellectual culture beset by a ‘plague of books’. Such problems were both epistemological and ethical: How could one claim knowledge on a topic when one could no longer read everything written on it? How could one reasonably judge what it was worth one’s time to read without actually reading it? Was this proliferation of disordered knowledge turning its consumers into thoughtless pedants or bluffers, who read and cited books only to support their rationally unexamined inclinations? How could the tremendous over-production of texts be transformed from a collection of paper facts into a manageable worldview capable of informing an individual life and a collective culture? Wellmon’s book surveys the history of such concerns from Bacon to Weber, and the ‘technologies’ that thinkers developed in response, from bibliographies to lectures, to the modern university itself, which (with some qualifications) was founded in Berlin in 1810 under the oversight of Wilhelm von Humboldt. Unlike the predominately oral medieval university, the new research university offered a solution in that it linked the proliferating world of paper to the collective endeavours of a particular community, defined by its own values and ethic—a discipline. But the new, disciplinary university did not simply supplant the earlier print technologies; it recombined them as elements in a complex, functionally unified ‘ecology’ of knowledge management methods. Though new technologies will necessarily produce adjustments in this ecology, Wellmon shows that a proper understanding of the functions of the research university within this ecology makes the idea of its obsolescence seem hopelessly naïve. The real interest of the book, however, is less in this polemic than in the contribution it makes to an understanding of the emergence and nature of the research university. In what follows, I shall attempt to summarise Wellmon’s main narrative, without following his chapter organisation, which focuses on particular details of the process. Following anonymous contemporaries, Wellmon styles the eighteenth century system of knowledge an ‘empire of erudition’: this system is the ‘republic of letters’, as transformed by a definitive supplanting of the written letter by the printed work. This world of print was initially conceived as a timelessly co-present order of printed texts, which found its unity and organisation chiefly in the mastery of individual erudites. Collectively, erudites made up a distinct social estate, to which entry conditions included the recognition of cultural networks centred on the universities (47, c.f. 155), and who, particularly in Prussia, monopolised the right to decide what counted as legitimate, learned culture. Their claim to authority derived from their capacity to master the totality of knowledge, through the complete representation of its contents. Yet in the eighteenth century, the world of print was already great enough that its individual mastery required the aid of specific types of bibliographical text: lexicons, which assembled (and converted) the disorganised and sometimes unpublished achievements of the epistolary age into published form; and journals, which (from 1665) reported on more recent achievements and debates in all fields. The genre of historia literaria (stemming from Bacon) took a more historical approach, recounting the story of knowledge chronologically. As well as assembling, communicating and preserving knowledge, these genres also served as filtering devices, helping their readership decide what to read among what one journal editor called ‘the great mass that appear[s] almost daily’ (51). Yet the erudites were also anxious about this filtering power: they feared that excessively selective bibliographical works would limit resources for the advancement of knowledge in ways unforeseen by their authors, and aimed instead to provide ‘raw material’ for an already erudite readership (educated in the unreformed universities) to use as they saw fit. Though such erudite works thus appeared to their critics as merely arbitrary collections of facts, Wellmon argues that historia literaria, and other forms of ‘bibliographic empiricism’ were a necessary stage in the prehistory of disciplinary science, for they assembled relevant materials in the form of traditions of science, relative to which specialist work could define itself (54, 59). Over the course of the eighteenth century, this world of erudition was broken apart by a double-challenge. Internally, the flood of texts was breaking the empire of erudition apart from the inside, overwhelming its bibliographic defences. The failure of bibliographic technologies to master an ever-increasing flood of texts (to which they in turn contributed) led to a fragmentation of erudition. It became simply impossible for the individual to master more than a portion of the sum of knowledge. One was forced to choose between knowing broadly and knowing well, and the specialist intellectual began to emerge as a result. At the same time, the erudite monopolisation of the world of learning was challenged by the ‘high Enlightenment’ (c.1750-1780) in the name of socially useful knowledge. In opposition to erudite conventions, the ideal was a ‘popular philosophy’, written in a more readily comprehensible style (62). For this movement, print was a beneficial medium that would free knowledge from erudite and university authority. Initially, this led to a proliferation of popular ‘moral’ journals, which challenged erudite authority over their erstwhile empire in the world of print, in favour of a broader readership of anonymous urban consumers. The universities, bastions of outmoded knowledge and unruly student behaviour, should be reformed on principles of social utility, as at Göttingen which was conceived as a money spinner for the mercantilist state (159), or replaced by academies and specialist schools (161-4). Yet the prodigious fecundity of the print industry created problems for the high Enlightenment too, as its popularising imperative conflicted with the (equally Enlightenment) demand for a growth of knowledge, which was becoming ever more complex and difficult to present. Its own technology, the encyclopedia, a collaborative attempt to unify the sum of knowledge, itself fell victim to the dynamic productivity of modern knowledge systems. At the same time, the Enlightenment embrace of a print market no longer regulated by deference to erudite authority, was inherently contradictory: the conception of Enlightenment as a print-mediated trickle down of knowledge to the people, presumed that the people were capable of distinguishing true from apparent knowledge—in short, that they were already enlightened. In practice, the demands of an as yet unenlightened reading public, and of a factionally contested state, threatened to undermine the cultural ability to distinguish science from opinion, and thus the very content of Enlightenment. To prevent moral degradation, the ability to think, reason, and recognise truth, which the high Enlightenment had taken to be a native dispensation, would have to be safeguarded and nourished by the establishment of a new form of university control. Naturally, the erudite response was defensive: bemoaning a corruption of culture, they wrote more strenuously than ever for themselves alone. Yet such anxieties were also felt by figures like Kant, who had been criticised for his blithe, laissez faire concept of Enlightenment (115). Kant’s response was to introduce into philosophy a genre distinction between ‘scholastic’ and ‘cosmopolitan’ (i.e. technical and popular) works. The Enlightenment could be saved only by the development of a new ‘scholasticism’, a university culture defined by the critical philosophy, which would supply the discipline necessary for the critical elite to fulfil its Enlightenment commitments in less formal, popular essays. In writing his Critiques in a deliberately (and, as Garve felt, artificially) ‘rigorous’ language, he sought not only to discipline ‘reason’, but to create a disciplinary test for the formation of a new cultural elite. As a system of formal categories, the new philosophy was a replacement for the Diderot-type ‘material encyclopedia’ (which Kant had previously advocated), and became the basis for a new kind of ‘formal encyclopedia’, which doubled as university textbooks, and which attempted to assemble not the ‘stuff’ of knowledge, but the basic principles of all the sciences. This was the seed of a new theory, and practice, of the university, as the home of a scientific practice capable of giving order and direction to the broader ecology of knowledge management institutions (museums, libraries, secondary schools, etc). Wellmon largely leaves off the story of the mutation of philosophy at this point, and focuses instead on the development of the theory of the university by Kant’s Idealist and Romantic successors, which provided the intellectual basis for the university reform movement of the early nineteenth century. Wellmon’s accounts of their essays on this topic are interesting and informative, but like other authors he gives the impression that the differences between them were less important than their common direction. In broad outline, the university was to overcome the epistemological and ethical problems caused by the surfeit of print, by cultivating in individuals the ethos necessary to handle it: ‘the way to manage the surfeit of information was to form people capable of navigating their way through it’ (215). Such a character could not be a passive consumer of information, but would have to stand in an active relation to knowledge, to be himself a researcher. Thus research, of a kind which had already emerged in practice at Göttingen, became the central duty of the professor. At Göttingen, such practices were simply the adjunct of a mercantilist effort to raise the international reputation of the university, in order to draw rich students into Prussia—a model that had proved difficult to reproduce elsewhere, for not every university can be famous. For the reformers, however, the reconception of the university as a community of researchers, unified by the pursuit of truth as an end in itself, and sharing an ethic derived therefrom (emphasising industry, care, critical intelligence, etc), was central to the broader ethical mission they assigned it. Only because the researcher’s works were products of this culture could they command authority, even over those not personally competent to judge them. This principle of authority also made possible an acceptance of specialisation: in the Humboldtian conception, relations among members of the community would allow each specialist to take others as an authority in their own field, and thus to attain collectively that holistic intellectual and ethical orientation that had become impossible for the individual. The basing of hiring and promotion decisions on published research, ideally as judged by peers, did not thus reflect any disregard for teaching, but rather the idea that the teacher’s function was now less to pass on a fixed, authoritative truth, than to initiate the student into the critical culture of research. Whilst Humboldt approached the university at the altitude of state policy, it was his co-thinkers who played the greater role in adapting ordinary academic practices to the new ideal. Particularly interesting, if ultimately futile, was their rethinking of the lecture. Encyclopedic lecture programs, which allowed texts to be supplemented by verbal addenda in order better to keep up with the flood of books, had begun around 1750. From 1795, the Idealists and Romantics at Jena began to reinterpret such courses, less as the imparting of a static body of information, and more as a kind of dynamic re-staging of the rational discovery of the principles of the sciences. Because such lectures were addressed to the particular condition of the students, rather than to an impersonal addressee, they could even (however implausibly) be conceived as a ‘conversation’ or Socratic dialogue. Although Wellmon does not make the connection, the great philosophical works of the Idealists were also textbooks, and the conclusion seems inescapable that this development was linked to a further ‘technological’ development of philosophy, and in particular to the rejection of the static architectonic of the Kantian system in favour of various attempts at developing a more dynamically unfolding, ‘dialectical’ form of philosophy. The later ‘return to Kant’, which we now know was not a doctrinally unified movement, could then be understood as a consequence of the evolution of the research university. These encyclopedic technologies, however, were themselves to fail due to their inability to keep up with the dynamic productivity of the ever-advancing, ever more specialised practice of research. In a highly suggestive final chapter, Wellmon surveys the trajectory of the philological discipline, the first special science to exhibit this colossal capacity for growth. In part this was because the Humboldtian reforms had secularised secondary education, creating a large labour market for humanistically rather than theologically educated teachers. Internally, the engine of this productivity was the research seminar which, though Wellmon does not put it this way, seems to have triumphed over the Idealist lecture as the chief locus of the research discipline. Wellmon’s account has the virtue over others of giving a clear sense of how the seminar could assume this function, having originated as a seminary for the training of priests. Another virtue of his account is to show how the program of leading early philologists such as F. A. Wolf and August Böckh, heads of the Halle and Berlin philology seminars respectively, can be seen as an intermediate step between Idealist conceptions of unity and the fragmentation of disciplines. For Böckh at least, the scientificity of a special science consisted not in a series of discoveries or a timeless method, but in a self-enclosed, theoretically-unified framework of concepts and methods, which (contra Kant) was explicitly conceived as the result of the science’s (incomplete and ongoing) history as a practice. Accordingly, a science could be shown to be such only through a reflexive historical account of its development. As any such account would necessarily be philological, this effectively made philological (and not philosophical) reflexivity the ‘basis of all disciplines’ (250). In other words, it would seem Böckh has a claim to be the first ‘social epistemologist’. Wellmon is aware, of course, that the research university failed to resolve the problem in the terms in which it was initially posed. Within a decade of its founding, the Berlin seminar had expanded total philological knowledge immensely, but only at the cost of becoming a factory for Kuhnian ‘normal scientists’: interested only in the ‘familiar business’ of their narrow subfields, ignorant of the unity and history of the discipline, producing works that were often trivial and unimaginative, and characterised by ‘a certain thoughtlessness’ as Böckh complained in 1820 (255). The main conclusion to be drawn from Wellmon’s study would seem to be that disciplinary science solved the cognitive problem of information overload by its authoritative direction of the student, but that the broader ethical problems highlighted by thinkers from Kant to Böckh were perpetuated by the fragmentation of Wissenschaft into a series of disciplines. Wellmon might have underscored this a bit better in his discussion of Weber, the final figure in Wellmon’s history. Weber’s recognition that the research university established an ethic of research, centred on truth as an ultimate value, can indeed be seen as a partial continuity with the Humboldtian conception. However, Weber’s perception of an irreconcilable, ‘tragic’ conflict between this pursuit and other, equally valid, ultimate values must surely be explained as acceptance of the failure to achieve Humboldt’s broader ethical aims. Perhaps the chief virtue of Wellmon’s book is that he provides a convincing framework for thinking about the emergence of the research university. More conventional treatments, which focus on philosophical concepts of Bildung (character-formation) or bureaucratic desires for the rationalisation of an increasingly dissolute institution, tend to leave one puzzled as to why it was the research university that was invented. Wellmon makes clear that the Humboldtian reforms were only one stage in a longer, quasi-Hegelian process of transformations of quantity into quality, whereby previous systems of intellectual production were broken apart by their inability to organise an increasing input of intellectual energies. In such a context, it was only natural that concepts of Bildung and programs of rationalisation should incorporate the practice of research, so that the reforms did not create so much as channel and redefine the ‘research imperative’. However, it seems to me that, though he nicely identifies the underlying process of development, Wellmon’s approach fails to fully illuminate it. In the first place, more quantitative information about the proliferation of printing would have been useful. More importantly, Wellmon’s theoretical approach only takes one so far. Wellmon conceives the university as a practice, in MacIntyre’s sense of a discrete form of cooperative activity, unified by its own values, norms and virtues (202). Yet he also treats this practice as a ‘technology’, a metaphor which is useful to a degree, in that it highlights the way in which the university was ‘devised’, and was thus a ‘device’ intended to resolve some of the same problems encyclopedias had earlier evolved to tackle. Yet this metaphor can also exaggerate the boundedness of university practices, and their distance from less ‘designed’ social relations. In the end, the research university is not a technological invention but a legal modification of more basic economic relations, which (together with norms of family upbringing, religious life etc) continue to determine the interests, attitudes and assumptions of its members. For Wellmon, this ecological setting is occluded by a more abstract (and somewhat Kantian) drama of a contemplative subject confronted by the problem of synthesising a manifold, which, inconveniently, keeps growing so that new means of synthesis are constantly required. Nor can the growth of print be understood, except in connection to broader social relations, for it is not principally a consequence of technical improvements in the printing process, but of the growing number of aspirant writers, which itself cannot be understood apart from the social context of a struggle for social mobility and for an intellectually stimulating life. Behind ‘too many books’, one finds too many writers, in short, intellectual pauperisation and proletarianisation—problems which are equally as pertinent today. Nor can this be understood save in the context of more general growth: growing population, urbanisation, capitalisation, and so on. But though Wellmon does not disguise the fact that the Idealists’ concerns about information overload are closely linked to their concerns about commodification, bourgeois philistinism, and the like, he lacks the theoretical framework to do more than indicate this connection. As an associated point, Wellmon’s first chapter, which sketches the history of the concept of science, might also have been improved by use of the language of public and private, i.e. of property, which actually seems better to fit his point (it is, of course, basic to the idea of publication), than the language of subject and object, which leads to some confusions which cannot be covered here. Finally, in this connection, it is important to realise that the intellectual communism of Feuerbach, Marx and Lukács was as much an heir to Humboldtian conceptions as was Weberian tragedism. Nor, today, can the crisis of the university be separated from the double-crisis of state finance, and of international capitalism. On the other hand, neither can this double crisis be separated from the crisis of disciplinary science and the research university. For the economic and political crises are in part a function of a lack of any clear idea of what an alternative might be, which itself may be in part a function of the fragmentation of knowledge into a series of only loosely interacting research programs, and of the disconnect of academic knowledge from the wider society. In this context, though Wellmon’s intelligent and stimulating book may not provide the answers, it will be an important resource for those wrestling with the fundamental problems. It would be interesting to hear more about the link between this transition and the shift in political metaphors. Wellmon does not explore the very limited character of this historicity. See e.g. Márkus, 1987, ‘Why is there no hermeneutics of natural sciences?’ in Science in Context, vol. 1, issue 1, pp. 5-51, also in idem, 2011, Culture, Science, Society, Leiden, Brill. In some respects, Wellmon overemphasises Kant’s novelty vis-à-vis e.g. Descartes, whose philosophy was already a discipline of reason, conceived as an antidote to the proliferation of texts. In this respect, Kant’s philosophy is simply a renovation of an existing ‘technology’. Derrida fans will also pick up on the logocentrism that emerges here, and in the contrast between the orality of the university community, and the heteronomous, alienated world of texts. Wellmon might also have mentioned the political and religious limits on acceptable opinion at the time. In this, as he himself points out, his book is a good complement to Clark, 2006, Academic Charisma, Chicago, Univ. of Chicago Press: each book goes some way to overcoming the limits of the other, as of course do other available works.